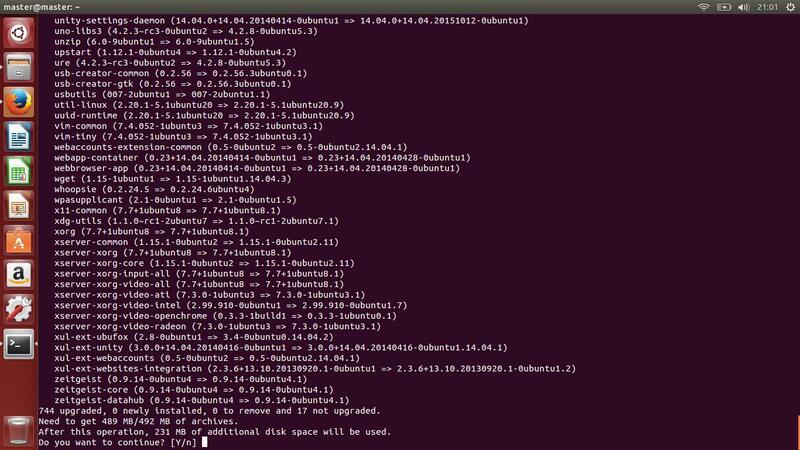 Upgrading between LTS versions is allowed in Ubuntu. 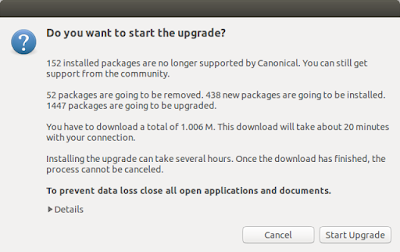 This means you can upgrade 14.04 directly to 16.04. 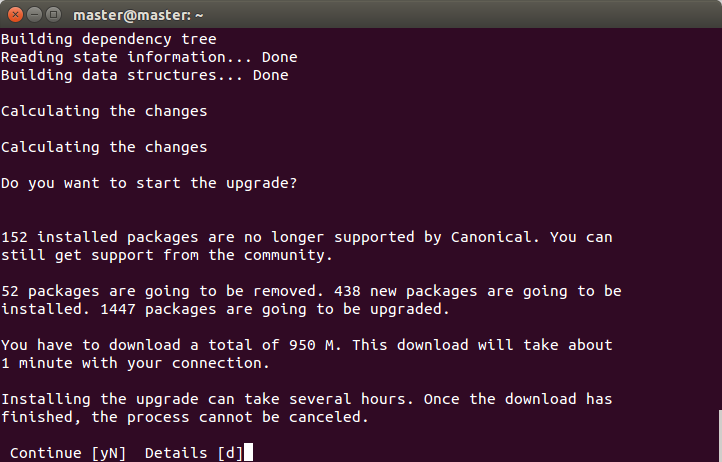 This article explains the easy ways to upgrade you may choose either automatically using Software Updater or manually using Terminal. 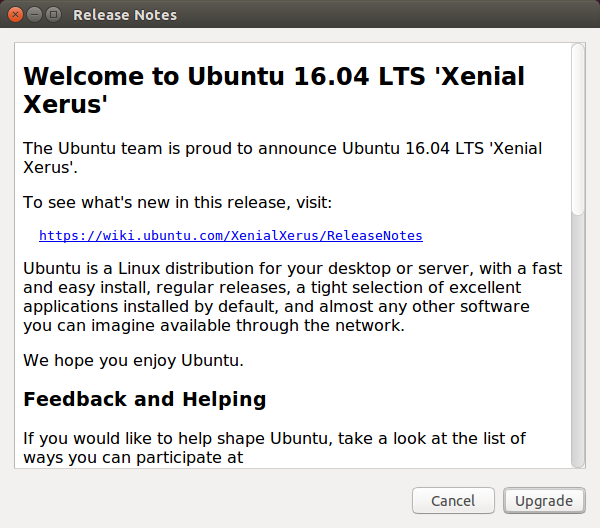 You will see on screen on 14.04 a welcome message saying that 16.04 LTS is available, and, detailed process of whole upgrade session. Enjoy! It's strongly better to have fast download speed i.e. 1 MegaByte/s and above. Make sure your electricity & internet connection are stable for a long time. Make sure your HDD free space is enough at least 2.5GB free. Prepare yourself for some hours in front of computer. For example, 4GB free space is enough. Upgrade using GUI program Software Updater is the easiest and automatic way for most users. Choose this if you don't know in using Terminal. 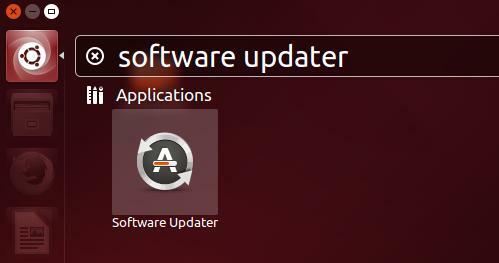 Run Software Updater by running the Software Updater icon from menu. 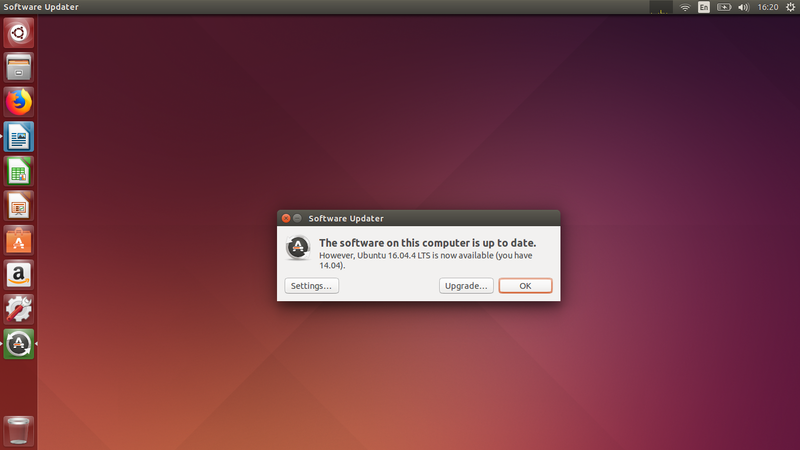 First, the Software Updater will say that 16.04 is now available and that you currently have 14.04. This means you are ready to upgrade to 16.04. There are 3 buttons: Settings, Upgrade, and OK. Click Upgrade to start upgrade process. Second, you will be asked for password. Enter it and press Authenticate button. Third, you will be shown a summary message of the upgrade. Picture below showing that the upgrade could download 1GB of data, in approximately 20 minutes, and it warns us that the process could take several hours. Press Start Upgrade button. 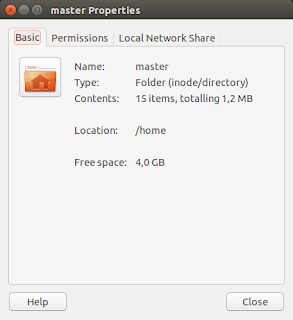 Fourth, you will be shown a welcome message to enter Ubuntu 16.04. This is the Release Notes with detailed information about that new version. Press Upgrade button. Fifth, Distribution Upgrade will show itself processing the whole upgrade process. 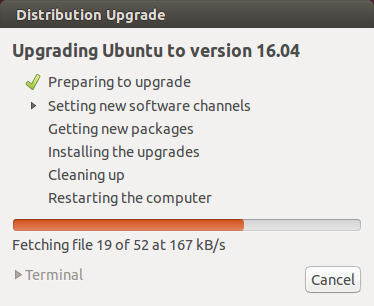 It says "Upgrading Ubuntu to version 16.04" while progress bar below showing download speed and the progression. Please notice that upgrade process may take 2 hours or more! Wait until all process finished. 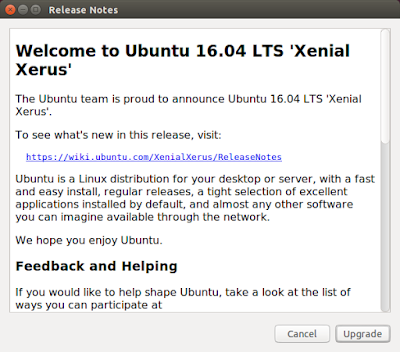 Once finished, you will be asked to restart and have a nice day with the new Ubuntu 16.04. 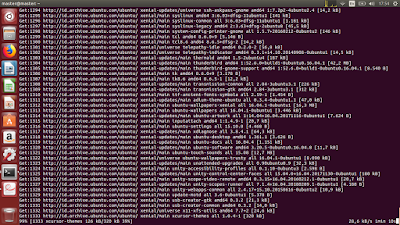 You may use Terminal when you have bad experience with GUI upgrading or you like CLI better. 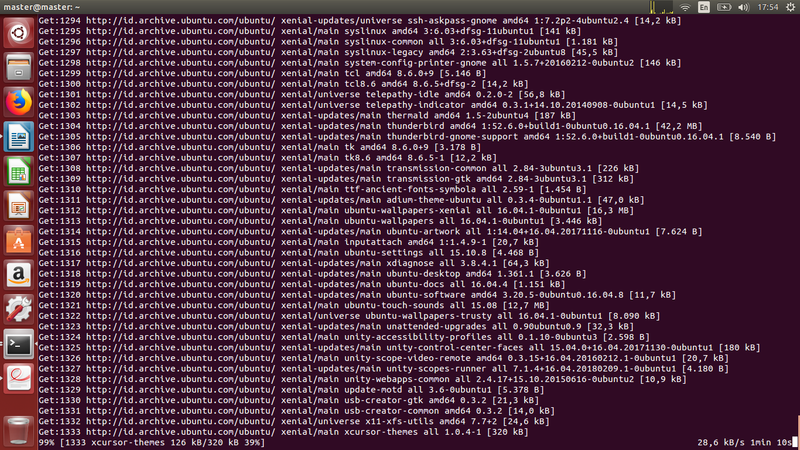 All you need to do is just wait until whole release upgrade processes finished. Once finished, you will be asked for restart and enjoy 16.04! 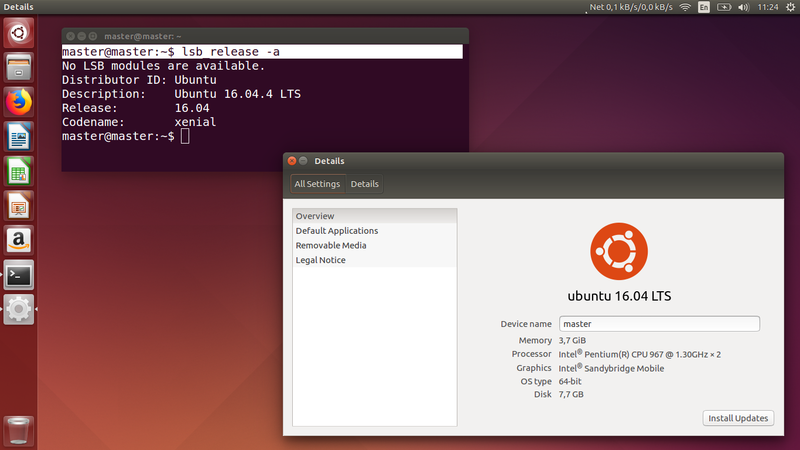 Once finished upgrading, you will notice your Ubuntu changed to 16.04 LTS. Check this by running command line lsb_release -a or easier with opening menu and typing 'details' and pressing Enter, both must show description Ubuntu 16.04 LTS. See picture below. Enjoy! In terminal, press Ctrl+C if you need to cancel any process. 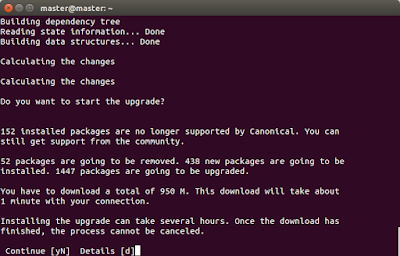 Repeat command do-release-upgrade to resume if by any chance you cancelled the upgrade process. From a freshly installed 14.04 to 16.04 you will download approximately 1300 packages in size of 1GB. 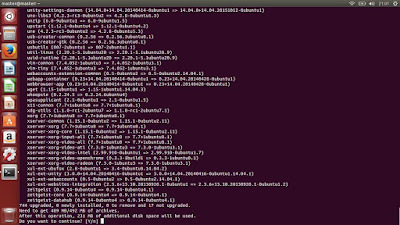 It will take approximately more than 3 hours to finish if your Ubuntu is installed on a SD Card or USB Flash Disk or other slow storage disk.